Risk modelling firm AIR Worldwide has released what it calls the first severe thunderstorm risk model for Australia that captures the three main sub-perils of tornado, hail and straight-line winds, a move that will help insurance, reinsurance and also ILS fund managers to better assess and manage risks in Australia. Australia has been hit by a number of severe thunderstorm loss events in recent years (including one earlier this year), particularly in the Sydney and New South Wales regions, with losses to insurance and reinsurance capital seen from some outbreaks, as well as some attritional impacts to ILS fund managers that have exposure in the region. As such and given the magnitude of some of the recent thunderstorm and hail losses, Australian severe thunderstorm risk has been seen as an increasingly important peril to monitor, leading to a renewed focus on the region by risk modelling firms. The AIR Severe Thunderstorm Model for Australia allows users to simulate daily severe thunderstorm activity based on historical occurrence rates, as well as local and seasonal weather patterns. The daily simulation enables the model to capture both the large outbreaks that produce insured losses in excess of AUD 10 million—the ICA threshold for a catastrophe—and smaller events that may last only one day, but that could still impact a company’s portfolio on an aggregate basis, or a more rural portfolio on an occurrence basis. The AIR model utilizes historical data from Australia’s Bureau of Meteorology (BOM) Severe Storms Archive, which comprises storm reports from a trained weather spotter network. 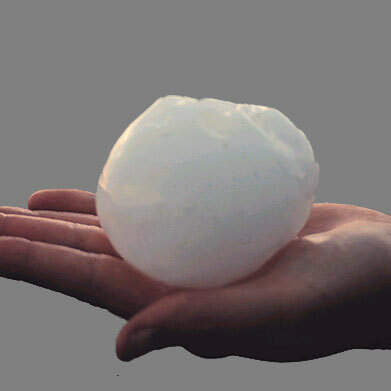 To compensate for inherent bias from eyewitness reporting of the historical data, AIR employed a hybrid physical-statistical method to simulate hail, straight-line wind, and tornadoes in physically realistic locations, including areas that may not have experienced major activity in the brief historical record. This method blends information about atmospheric conditions conducive to severe thunderstorms with BOM storm reports data, resulting in a spatially complete catalog of simulated events that offers companies a more accurate view of their severe thunderstorm risk. Thunderstorm weather systems can last for several days and affect multiple states, but the individual tornadoes, hail swaths, and straight-line wind swaths (the “sub-perils”) that make up an outbreak may last for just minutes and affect highly localized areas. To capture the localized effects, AIR developed high-resolution event footprints specific to each sub-peril. Additionally, because hailstorms, tornadoes, and straight-line windstorms inflict damage differently, the model’s damage functions are sub-peril-specific to provide more accurate loss estimates. The model also simulates realistically clustered severe thunderstorm outbreaks using methodology that groups hail, wind, and tornadoes into spatially coherent patterns—patterns that would not be possible using random sampling alone. Dr. Robinson commented; “Loss potential is increasing as property replacement values rise in the densely populated cities of Australia, and the number of insurable exposures continues to grow as development expands into previously unpopulated areas. AIR also said that updated models for Australian tropical cyclone, earthquake, and bushfire are all available in its CATRADER® Version 19 and Touchstone® 5.0 catastrophe risk management systems, as well as the new AIR Severe Thunderstorm Model for Australia.